Displays data in the form of a matrix, every object is shown as a card within a cell. The developer can customize the display of the field inside the card at its discretion. It is possible to customize the number of display options via the Model Editor. List Editor supports Web Editors Templates technology. You can view the code used in this lesson in the Xafari.XtraEditors.Module | Editors| CardListEditorObject.cs file of the Xafari XtraEditors demo installed with the product. Next, it is required to implement the Card List Editor template for displaying CardListEditorObject objects. You need to create Web User Control (.ascx file) which implements controls and layout to display CardListEditorObject class properties within the page. 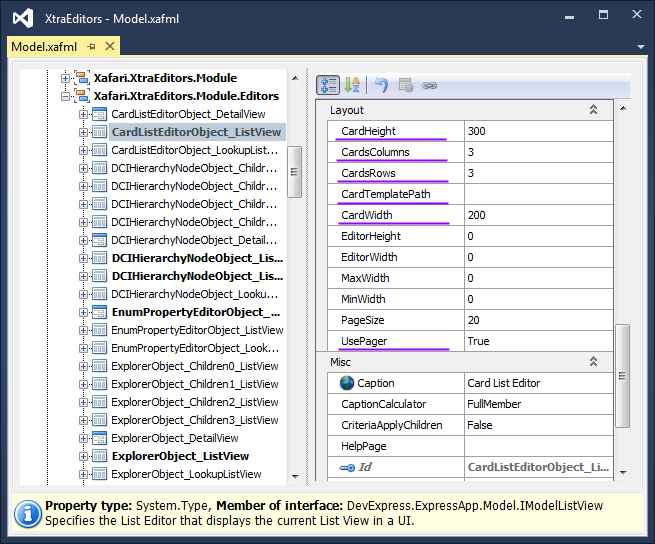 Note the DevExpress.ExpressApp.Web and DevExpress.Web assemblies versions. You should reference the appropriate assembly for your version of DevExpress. 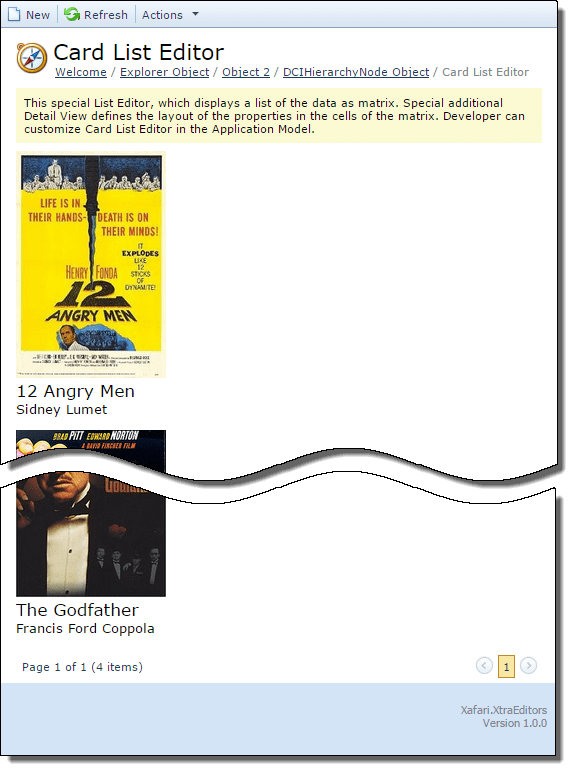 rowPanel CSS class is suggested for the card rows, and cardPanel class is suggested for each individual card. Once the template is ready, invoke the Model Editor. Navigate to the CardListEditorObject_ListView node. Set the PropertyEditorType property to Xafari.Editors.Web.ASPxCardListEditor. Now you can build and run your applications, and see what they look like after these changes. CardsColumns and CardsRows specify the number of cards in the row and column. The default value is 3. UsePager is a flag specifies whether to use the CardsRows value or not. If UsePager is false, then the CardsRows value is ignored, and all the elements of the list will be loaded. The default value is true. CardTemplatePath specifies the location of the template, this property is required when using Web Editors Templates.